or e-mail the Webmaster for prompt forwarding on to Management. 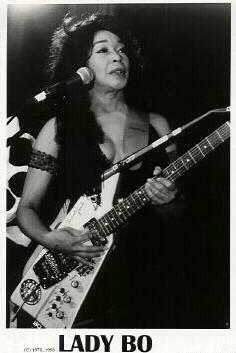 We are indebted to BO DIDDLEY's original girl guitar player, LADY BO, for the following contribution to these 3 special 70th birthday tribute pages. "Hey, Da-Da-Dee-Dum-Dum, HAPPY, HAPPY, HAPPY, HAPPY, Ellas McDaniel is his real name. He's the guy that wrote "I'm A Man". He wrote "Diddley Daddy" too. 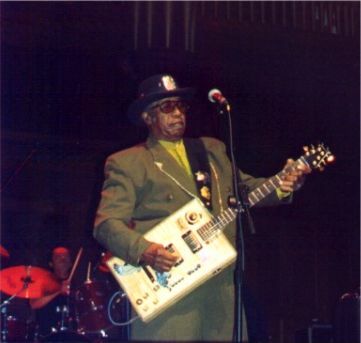 He even wrote "Bo Diddley" just for you....so you won't forget. He had a "Guitar, Will Travel". While "In The Spotlight", Bo became a "Lover", a "Gunslinger", "Road Runner", "Twister", a "Boss Man" and "Bo Diddley Was Loose" as a "Lumberjack" and sang opera. After all, in "Another Dimension", "Big Bad Bo" was "The Originator". In the beginning "Where It All Began", he thought "Ain't It Good To Be Free", 'cause after all "The Mighty Bo Diddley" was just "Bo Diddley". Today we collect "His Best Sides" in Chess boxes and Jewel boxes and such. Yeah! Yeah! We're "Crackin' Up". So "Go Bo Diddley", "Love Is Strange". BIRTHDAY GREETINGS from my rhythm section (The Family Jewel): Wally Malone - bass, Rich Alves - drums, Pam Arthur - keyboards, my BC Horns: "Lord" John Halbleib - 1st trumpet, Dave "Sir Duke" Wells - sax, Bill Murphy - sax, my sisters Patrina and Patricia, and my four nieces, and Benny Mendez - security and support crew, plus all fans and everybody here in San Jose, San Francisco and Monterey.